In the first chapter of Luke The Annunciation(Luke 1:26-38) is described. We read how the angel Gabriel announced to Mary that she had been chosen to be the mother of the Christ, and how Mary answered, “Here I am, the handmaid of the Lord. Let it be to me as you have said.” It is reasonable to suppose that Our Lord ws conceived immediately after this. Accordingly, since we celebrate His birth on 25 December, we celebrate the Annunciation nine months earlier, on 25 March. We had 18 for this service preceded by a covered dish supper. A snowstorm of 4+ inches eliminated most of the events of the past week. 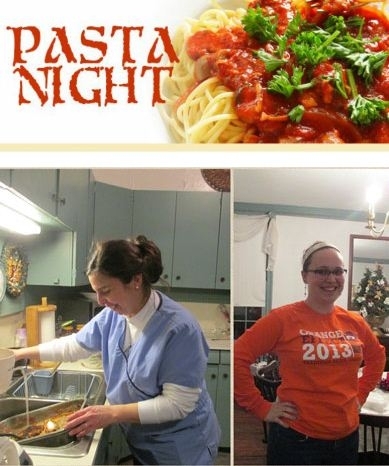 Both Shrove Tuesday and Ash Wednesday were eliminated as well as the remainder of the Wednesday activities – Bible Study, ECW and the Food distribtution. We had 35 at the service on Sunday, Feb. 22, Lent 1. The sermon dealt with transitions which are apparent in the Gospel reading from Jesus being baptized, to being driven into the wilderness for 40 days and finally beginning his ministry proclaiming the Kingdom of God. Eight from St. Peter’s enjoyed an exhibit of 60 Renaissance- and Baroque-era paintings from many museums around the globe all depicting Mary. The exhibit is at the National Museum of Women in the Arts in Washington. 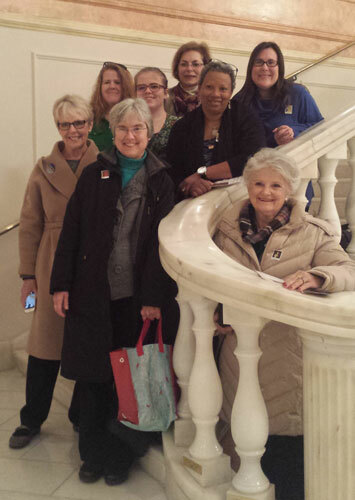 The trip was an extension of our Advent study on Mary, “Singing Mary’s Song” and led by artist Susan Tilt. It will continue until April 12. 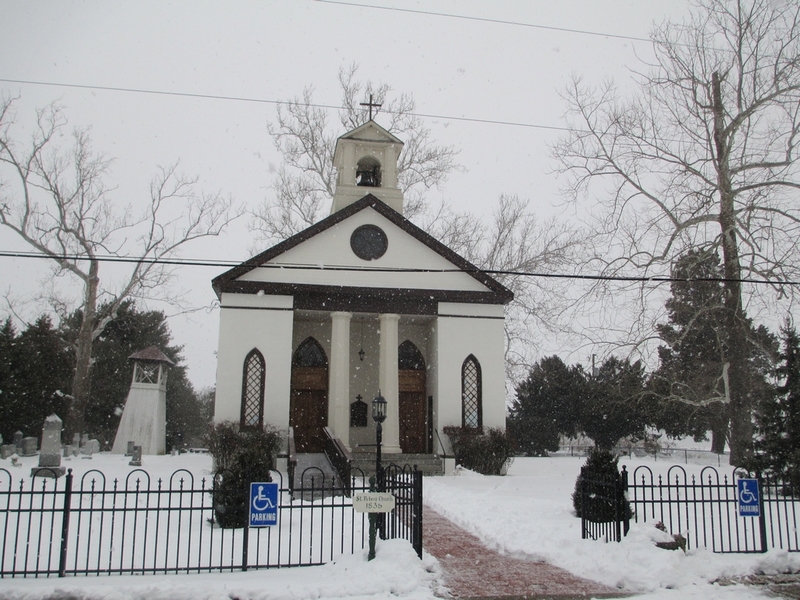 A blustery night greeted us for the Presentation of Jesus in the Temple on Feb. 2.It is the day we celebrate Jesus Presentation in the Temple as was custom at that time. The day has taken on a different name, Candlemas centuries later. 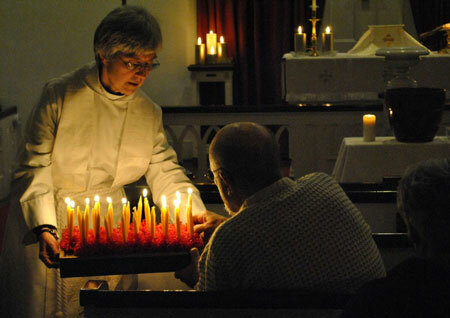 It was the day of the year when all the candles, that were used in the church during the coming year, were brought into church and a blessing was said over them – so it was the Festival Day (or ‘mass’) of the Candles|We had 26 in attendance with help from the Rev. Bambi Willis and St. Asaph’s congregation. This was a special night for Bambi as it was the one year anniversary of becoming rector of St. Asaph’s.|Amy Meyer brought her new 47 string 1974 concert harp to the service. She provided a 20 minute concert before the service and played at times during the service. It echoes in our space and spreads outward. Denise Symonds was our organist. We had 36 for the service which included a Congregational meeting.This is an annual event where at the least elect new Vestry members to serve a 3 year term. 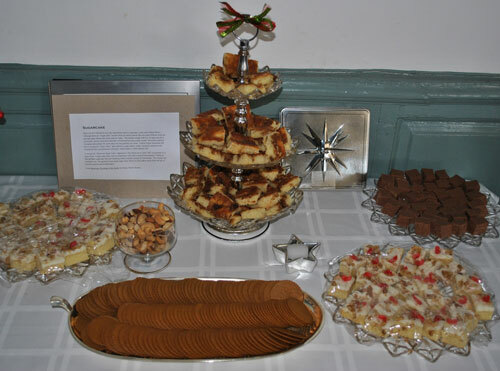 Catherine’s introduction of the Love Feast-We had 56 at the Love Feast on Dec. 24.This service was the culmination of our Advent in introducing Moravian traditions. We hosted the during Coffee Hour on Dec. 7. 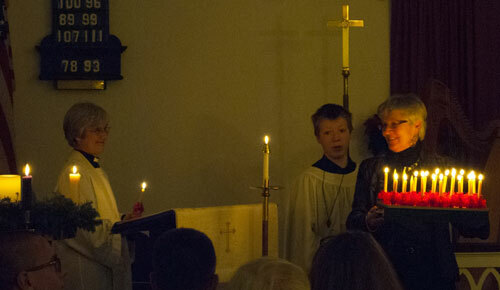 We have added Moravian musical pieces such as Candle Glowing for the Advent candle lighting each Sunday. 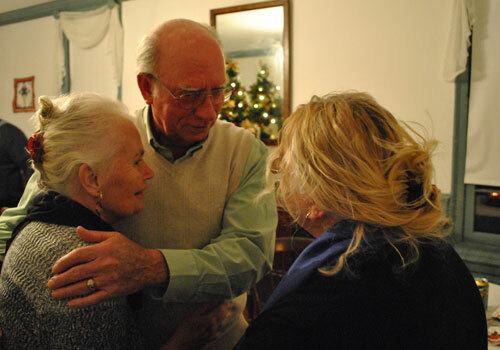 The Love Feast was the final celebration. Here is from the service.Thanks to Marilyn, Amy, Helmut and Brad who provided the music before the service and the choir during the service. The Love Feast required many hymns! This year’s play was shorter and simply told the entire story. Highlights included Mary and Elizabeth’s moving dialog. (Cookie memorized her lines and was very effective). Alex rendition of Angel Gabriel was also magnificent helped by his height and booming voice. (This is actually his favorite part that he played in year’s past). Mary and Joseph did a wonderful job with the Baby Jesus even when the latter started crying. 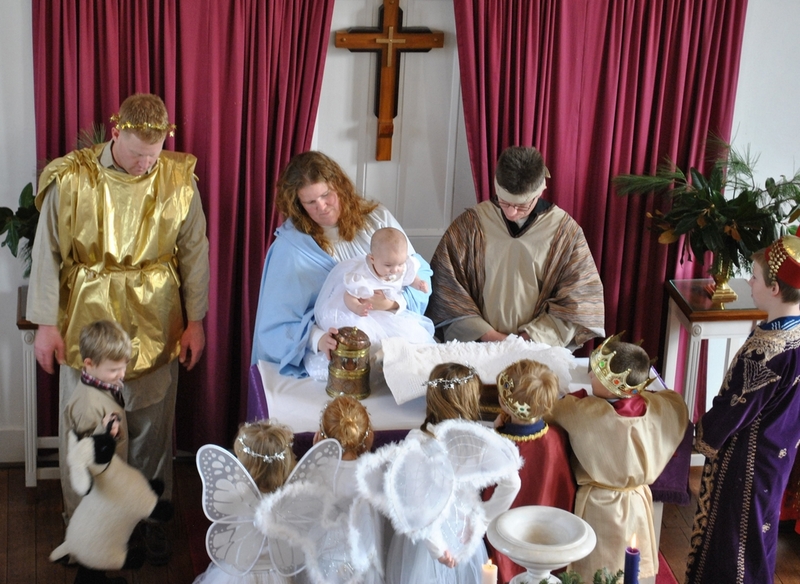 The Shepherds and angels acted out their parts well.Of note were the costumes made by the Fisher family. It is an amazing set that will last for years. Callie also was able to get all the children into costume before the play and keep it all together. This is not a Christmas party but a Christmas experience. In every room in the Everett household you are surrounded by Christmas. It is challenging just to see everything. And their collection is still expanding! This year was special since it was Cherry’s birthday. We sang “happy birthday” and had a combined Birthday/Christmas chocolate cake. Also as the festivities began, we were at sunset along the Rappahannock with a wonderful light and the occasional heron flying by. There is a separate home attached with a inground pool covered over for Christmas. In this room are larger Christmas exhibits, including a manger scene, Santa in a balloon and a wire Christmas tree. (Don’t even try to count the trees in this house!). A long table was set for dinner for 30+. The Port Royal Christmas event has centered around lighting the town Christmas tree, opening the Christmas season. 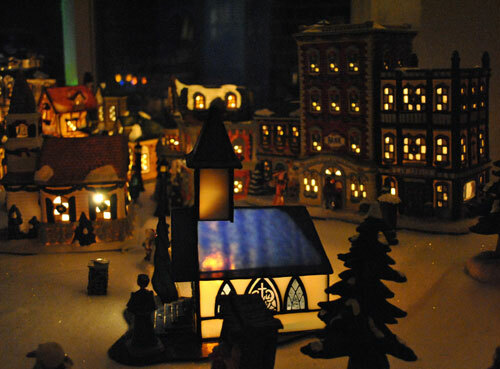 However it is much more and is really a Christmas party for the whole town with food, games, songs and a vist from Santa. 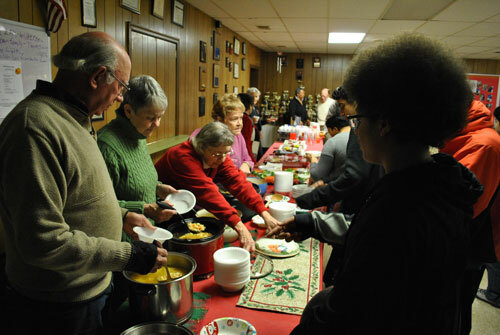 St. Peter’s provided 3 types of soup, chicken noodle, chicken vegetable and vegetable plus there were hot rolls and a raw vegetable tray from Memorial Baptist. 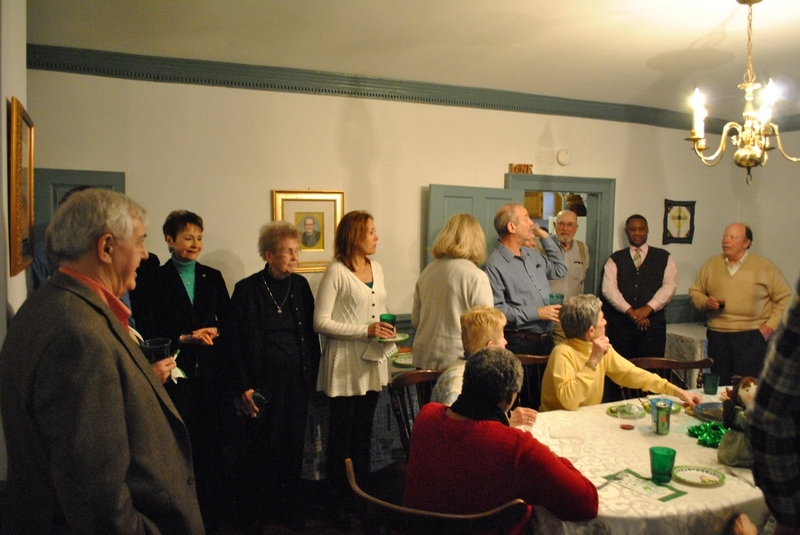 St. Peter’s provided most of the servers for the food and drink. After a soup dinner, Nancy Long (whose birthday was on Friday also) led a group out for the Christmas tree lighting and caroling. Finally after a phone call, she led the group to the front of the fire house where Santa arrived in a Port Royal fire engine. 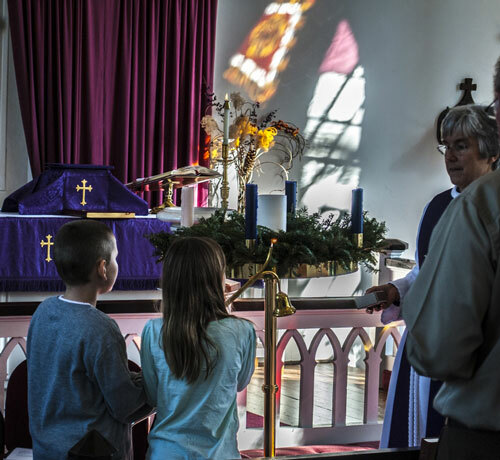 Two services to begin Advent – 9am Morning Prayer, Rite 1 and 11am Holy Eucharist Rite 2 with 7 and 32 at each service, respectively on a relatively mild Nov. morning for this time of year. During the 10am hour, we had the second part of the Advent Christian Ed study, Singing Mary’s song with 13 present. Advent was setup with a change of color to purple and pink. At 11am we had the lighting of the Advent Candle by Michael and Sydney. A Moravian hymn was introduced for the ceremony – Candleglowing. Each week we sing a different verse. The sermon was taken from the latter sentences in Mark and was a dialog between the master and his slaves trying to keep his teaching alive, to share the good news. In our first food distribution, we gave out food to twenty families for a total of sixty people, 3:30pm to 5pm. 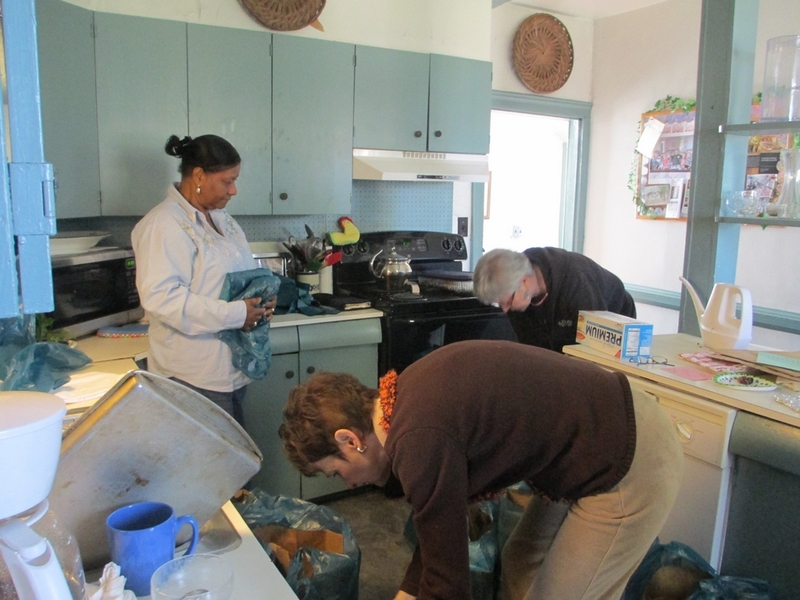 We gave out 80 cans of soup, and 300 pounds of fresh produce. 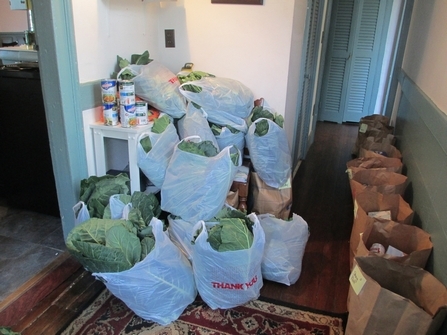 (We did 700 pounds in Dec. ) The produce included white potatoes, sweet potatoes, collards, carrots. We also distributed kleenix. Some received chickens (16) and some recipes for collards and carrots. Thanks to all who contributed and worked to create this new ministry. The ECW was instrumental in getting the bags together for the event and working to distribute.